this tutorial explains the relevent contents of your WoW Client. Inside the CASC everything is organized in a folder structure. It is key to maintain this structure of the client will not load your data. So I will explain what belongs in the folders. Some folders have been left out since they are not really important for modding. If you are interested you can have a look for yourself. BLP - Blizzard Picture is Blizzards own image format. You find texture, maps and interface elements with this type. DBC/DB2 - DataBase Client files store the data for the client. You can think about them like excel files. You have rows and columns of data describing many things. For example what maps you have or the races, spells and much more. LUA - Are script files in the language Lua that defines the actions for the interface. Like what happens if you click the login button. XML - These files define the look of the interface. It places images, models and UI elements. M2 - Models like creatures, trees and other small stuff. WMO - World Models are bigger models like houses, bridges or full cities and dungeons like stormwind or Deathmine. ADT - A Maptile of a map like Azeroth. Every map can have 64 x 64 tiles in full size. WDT - A map definition file. It defines if and what ADTs on the map exist or if the map is built only out of one WMO like instances. WDL - A lowres heighmap of all ADTs of the map. This file is used to display far away mountains. The simplest way tp mod the client is replacing exiting files. A example would be changing the Color of a Item. Todo so create a folder called item within your WoD Client. Locate the texture you want to replace and copy it with its folder structure. Edit the blp as you like and place it in your folder. You modified WoW will load this file and repalce the original one. Though its very easy its not recommended to replace original files. A better way of creating items can be found in the tutorial explaining Item creation. In WoD there is a new db format called DB2. Both files can be opened with the WDBX editor. There are different editors out there but I reccomend using WDBX. When opening up a file with WDBX you will be asked wich version to use. Pick WoD 6.2.4. Dont be afraid. I will explain alot of that in more depth once we need it. Hello and welcome back. Today we will tackle a topic that is an obstacle for most modders. Setting up a Server. To make things easy I created a package containing my WoD Server. It differs in small parts from the original WoD trinity core which should not affect you. Though I recommend you compile yourself your own Server. You can find a link and some notes on that further down this post. Heidisql should not be a problem to install. Once you have finished installing goto your WoDModding Folder and open: "WoDModding\Projects\". Inside there extract my Server. During MySQL Configuration, near the end of the installation process, create the user trinity with password trinity to match the trinity:trinity settings in the default server .conf files. Make sure that this user is set to have the DB Admin role and with Host type localhost instead of the default <All Hosts (%)> because of the low security of the well known password "trinity". You can also choose your own user and password to increase security but it's only really needed if you want the server to be public at some point. Just install from Link above. Once you have finished installing mysql open your heidisql and create a new connection with the username and password from above. Inside this Server you can find a folder called SQL. Open it and you will find an Sql file. In order for the Server to work you have to execute this file. In later tutorials I will explain the database as we use it. If you changed your username and password from trinity to something else you have to adjust the config files. HotfixDatabaseInfo = "127.0.0.1;3306;trinity;trinity;hotfixes6"The first trinity is the username the second is the password. LoginDatabaseInfo = "127.0.0.1;3306;trinity;trinity;auth6"Repeat this for the other file. You have to extract some files from your client to make the server run. To do this copy the contents of the extraction folder within your server to your client folder. There, simply execute extractor.bat and choose option 1. Wait for the extractor to finish and then copy the folder dbc and maps to your server folder. Once you're done with the steps above you should be able to start both server executables. Wait for them to load up and then go to your worldserver.exe. The first command creates a new account. Make sure you have a username that contains a @. Make it look like an e-mail or it won't work. The second command enables your gm status so you can use in game gm commands. Once all this is done restart your server and try logging in. 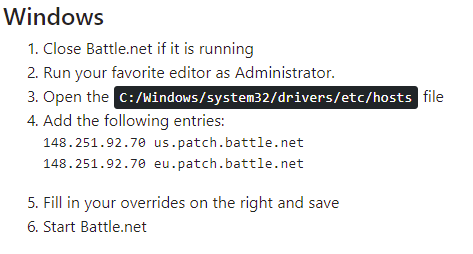 Make sure to use my executables in your WoD client. You should be able to log in game now. SET portal "127.0.0.1"If you don't have this folder or file start your client once and close it again. This tutorial simplifies a lot of the steps for you, but some mods require you to make serverside changes. This tutorial is meant for those who have trouble compiling code. That's why I highly recommend that you compile your own Server using the Trinity Core tutorial if you are capable of doing so. Make sure to get the right commit from the master branch or you will end up with a Legion server. DBC / DB2 / DB modding / Important information before posting! Please note that this board section is dedicated to Warlords of Draenor. Before you post any topics make sure your topic is related to Warlords of Draenor. If your post is not realted to it it will be moved. Hello and welcome again to our second part of the tutorial series. This time we will focus on setting up your work environment. Copy the content of your WoW client to: "WoDModding\Clients\6.2.4\"
Copy your tools to: "WoDModding\Tools\"
Now we will extract the client files. Note that this will only work if your client is a full download. In order to achieve this open your CASC Explorer in the tools section. Browse to your client folder and select it. The explorer will automatically open the CASC storage and display all files. Select all the folders within the display and right click extract. Now select the following folder: "WoDModding\ClientFiles\". Wait for the process to finish. You can continue reading while the program is running. One benefit of the new CASC system is that it's unlikely to break your client. Unlike MPQ where you can modify the base data of the game. In WoD modding the explorer is used to extract the base files so we can use it. Whenever you break one of your extracted files you can simply reextract. I will feature other tools as we use them in further steps of the tutorial. But feel free to take a look at the tools section where you can find a lot of different tools to use. That's it for this part, the next tutorial is about how to setup the a WoD Server. Hello everyone and welcome to the first part of this tutorial series. In this tutorial I'll explain how you can modify Warlords of Draenor. This list will be expanded as the tutorial progresses. As opposed to WOTLK,WoD uses the so called CASC format. This has some benefits and some downsides. Currently there is no way for us to modify CASC directly, but don't worry, there's a diffrent way. The executable from the list above allows you to simply place your files in your Client folder. Your client will load all files from there. Currently some things can only be achievedby modding a 3.3.5 Client and converting content up to 6.2.4. I have faith tin that we'll have proper tools in the future. Until then I'll explain it this way and update tutorials once there's a better way. If you have questions regarding WoD modding. Feel free to create a topic in the proper section or PM me. I'll answer once I have time. Below you can find a list of each individual part of this tutorial series. Miscellaneous / Important information before posting! Tutorials / Important information before posting! Serverside Modding / Important information before posting! Tools / Important information before posting! I managed to break the XML protection on the last WoD version. This allows in depth editing of the Interface. 1. This exe has no CDNS setup. So I recommend only using this on a full downloaded Client. I recently tried porting maps to Legion. Basicly what i did was convert them to WoD did the db2 entries and looked how things behave. The map should be full of objects. It also contains invisable walls. Does anyone have a Idea what could be the issue. I heared that they chanched somethign in the way objects are saved. Could anyone point me to a source where I can read about that chanche or even better know a direct Solution. I am looking for a clean WoW 6.2.4.21742 or better said the Last WoD client if anyone can provide that would be great!